On the foggy morning of 18 January 1955, Saadat Hasan Manto, one of the scions of modern Urdu literature, died in an apartment located off Hall Road in Lahore. Apart from the echoes of his turbulent life, his wife Safia and daughters Nighat, Nuzhat and Nusrat, were left with little else that day. His death, however, was no surprise. A penchant for drinking, which led to alcoholism, paved the way for Manto’s untimely demise. Sixty-three years after his death, Manto’s legacy still shines on. His stories resonated with the reality of his time, portrayed the struggles of the common people, the discrimination and miseries they suffered. His penmanship was undeniably sharp, it breathed fire and caused a furore among those who couldn’t digest too much reality. For many of his contemporaries, Manto was a source of inspiration, as well as discontent and restlessness, someone who stood by the intellectual superiority of his being. Even though he faced hardships, persecution, court cases and the scorn of his peer group, he rose above these challenges valiantly, refusing to remain suppressed. Anyone who has read Manto will attest to his sensitivity as a writer, but behind it all was a human being who detested falsehood vehemently and stood by those honest virtues that distinguished him from his peers. But did Manto play his part as a husband fully? Was he able to provide support for his daughters? His Lahore-based middle daughter and my mother, Nuzhat, whom he called Jujiyajee, remembers, “Abajaan used to tell Ameejaan that he had written so much, she would live comfortably for the rest of her life. Unfortunately, the publishers were very harsh and hardly paid any royalties." “He could see his own traits in me, the naughtiness and bluntness that formed part of Manto’s personality," she adds. “The way he drank was suicidal, and this is my grievance against him." She also recalls moments of fatherly affection. “I remember when we would return home from school, he would be waiting with a plateful of pomegranate seeds. Children from the neighbourhood would be invited to join in." Nuzhat was almost seven years old when Manto died. She didn’t get enough time with him and his absence left a void in her life. Zakia Hamid Jalal, Safia’s sister, reportedly said in a conversation in the early 1990s, “He always made fun that his wife’s sister was half-owner of the house and everything in it." Manto used to say, she added, that “if all of you sisters decided to exercise that right, I would find myself living on the footpath." 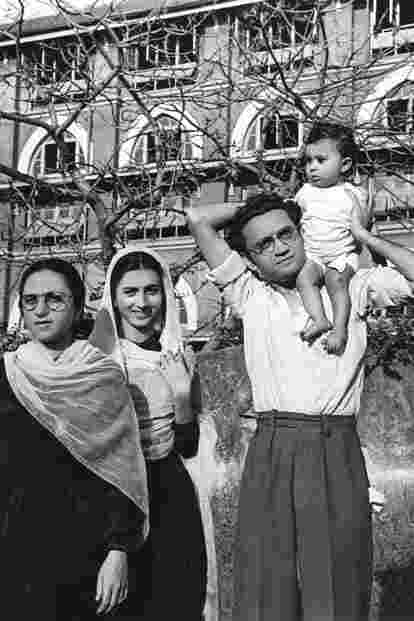 Manto with wife Safia (left), sister-in-law Zakia Hamid Jalal and baby Nighat in Mumbai. Manto’s eldest daughter, Nighat, also based in Lahore, in a conversation around the same time, remembered him affectionately. “We were very young, but we remember we would all jump on his bed first thing in the morning and he would make us sit on his stomach and talk to us and play games with us." “Our mother had very simple habits," she added. “Our father would help her do her hair, iron her clothes and cook. His speciality was making pakoras." Manto was profoundly jolted by the death of his firstborn, Arif, in Delhi in the early 1940s. It afflicted him with paranoia and obsession, which lingered on for some years. He wrote a short story, Khaled Mian, which was an actual depiction of Arif’s early demise and the impact it had on him as a father. Ironically, he changed the names of the protagonists in this story, which wasn’t a very Mantoesque characteristic. When asked about Arif and his death, Nuzhat says, “Our mother never mentioned or talked about Arif. She remained quiet and never expressed her sentiments regarding the colossal loss of her son." Manto migrated from India to Pakistan post-Partition in January 1948. He moved from Bombay (now Mumbai) to Lahore, where his family was settled, when Safia was pregnant with their second daughter, Nuzhat. In an interesting disclosure, Jalal said two years ago to me, “It was our mother’s decision to migrate to Pakistan, as she clearly told Bhai Saadat that her daughters won’t remain there in Bombay, due to the violence that was ablaze across the country." Making ends meet in Lahore in those days was tough for a writer, especially for one who had earned a reasonable income working in Bombay’s film industry. Lahore’s film industry, in comparison, was in a shambles after Partition. Opportunities were rare, financiers who once thronged the city migrated to India due to reasons of stability and to avoid the turbulence that had engulfed the region in those years. Financially strapped, Manto took to drinking even more heavily as opportunities remained limited and publishers were afraid to engage with such a volatile personality, who they deemed “controversial". But this was also a period of intellectual renaissance for Manto, who, despite his financial woes, was able to produce stories that were not only eye-openers but also masterpieces. But the opposition against his writing grew fiercer, as some of his contemporaries became his sworn enemies and the Progressive Writers’ Movement openly voiced discontent against his stories. “He was cornered from all sides; his source of livelihood was solely writing, and he was deprived of it," says Nuzhat. “Court cases, societal aversion and stiff opposition from every corner made his life a living hell." Manto’s alcoholism was also exploited by publishers and newspapers alike. He sold his writings at throwaway prices, just to get a bottle of liquor, in which he drowned his frustrations. As his financial woes worsened, he drank harder, effectively driving himself to the brink of suicide. His mind retained the same old sharpness, though. According to writer-musician Shahid Ahmad Dehlvi, in 1953, even as alcoholism began to take a toll on Manto, his speech remained bold and frank: “Every word was steeped in sincerity, free from artifice. In his mind and ideas, there was no holding back, no deceptive covers. He had no desire to impress or be impressed. He had no fear of calling good good and bad bad." In a late 1950s sketch titled Uncle Manto, Hamid Jalal, the writer’s nephew, wrote, “He distressed the family even more than his addiction to the bottle. He began borrowing money indiscriminately. He touched relatives, friends, neighbours, and I would say even strangers, for he could not resist borrowing even from fans who came only to pay their respects to him." The breaking point came when Nighat was afflicted with typhoid and the money borrowed to procure medication for her treatment was spent to buy a bottle of alcohol. Jalal adds in his sketch: “He must have been full of remorse and self-condemnation, for he tried to make-up by demonstrating his love for the stricken child. Despite his wife’s protests he sat unsteadily on the bed, his long hair falling all over his face, and tried to lift the child on to his lap and overwhelm her with paternal affection. When his wife dragged him away from the bed, he was enraged; he was determined to exercise his paternal right even if it meant resorting to violence." As time passed, the situation only exacerbated and led to a diagnosis of cirrhosis of the liver. Safia must have endured severe trauma and anguish during those dark days as Manto struggled with his addiction. But her steadfastness and resolve knew no bounds. In spite of her own prolonged frustration, she remained a bastion of strength for her daughters, says Nuzhat. “Irrespective of Abajaan’s death, our mother and immediate family provided us all the warmth and affection we needed, so the void of our father wasn’t felt as such," as Nuzhat puts it. “My two sisters and I had a happy childhood, despite Abajaan’s absence." Mohammad Farooq is a senior sub-editor at the business desk for Profit by Pakistan Today.